Western blot analysis of extracts from various cell lines using AHSA1 Antibody. 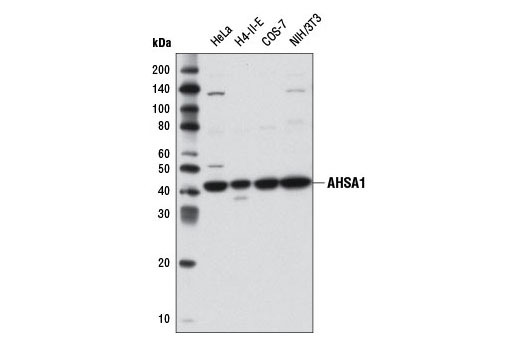 AHSA1 Antibody recognizes endogenous levels of total AHSA1 protein. Polyclonal antibodies are produced by immunizing animals with a synthetic peptide corresponding to residues surrounding Leu242 of human AHSA1 protein. Antibodies are purified by protein A and peptide affinity chromatography. Activator of 90 kDa heat shock protein ATPase homolog 1 (AHSA1 or AHA1) is a 42 kDa HSP90 co-chaperone that stimulates intrinsic HSP90 ATPase activity in eukaryotic cells to facilitate client protein folding and activation (1,2). Initially, HSP90 forms a ternary complex with a nascent client protein such as v-Src, c-Raf or CFTR, and the co-chaperone protein CDC37 (3,4). HSP90 then cycles through a series of conformational changes facilitated by ATP that results in the release of CDC37 and recruitment of AHSA1 - a process that is dependent on tyrosine phosphorylation of HSP90 and CDC37 (5). More recently, AHSA1 has been shown to have unique interactions with additional client proteins involved in RNA splicing and DNA repair, suggesting that AHSA1 may have also have a scaffolding role in recruiting client proteins to HSP90 (6). Panaretou, B. et al. (2002) Mol Cell 10, 1307-18. Lotz, G.P. et al. (2003) J Biol Chem 278, 17228-35. Holmes, J.L. et al. (2008) Cancer Res 68, 1188-97. Koulov, A.V. et al. (2010) Mol Biol Cell 21, 871-84. Xu, W. et al. (2012) Mol Cell 47, 434-43. Sun, L. et al. (2012) Biochim Biophys Acta 1823, 1092-101.